Kubbestols, traditional Norwegian log chairs, were created from the trunks of trees, their typically over-sized bases making them appear almost rooted to the ground, immovable. Kubbestols are a source of national pride in Norway and symbols of Norwegian heritage in America. This ethnic tradition is completely transformed when rockers, typically associated with movement, are added. Although this combination is rare, this rocking kubbestol made for Little Norway is a clear example of the reinvention of ethnicity. Often, chairs are considered utilitarian above all other characteristics. We need them for an easy way to sit down, we need them to sit at the table, we need them in crowded theaters, and we prefer different styles based on our comfort needs. However, chairs represent much more than a resting position. They communicate our identity and our lifestyle. Think of a rocking chair, a stool, and an office chair. These are clearly not interchangeable, but they all chairs and it matters which one you are sitting in. Created in the early 18th century, the rocking chair is a distinctly American invention. One of the most comfortable chairs ever created, the rocking chair is so soothing that people often use it to calm infants. When sitting in a rocking chair, the chair matches your center of gravity and keeps you in an unstressed position.It is a chair that refuses to sit still, but carries out its motion in a soft and serene way, shifting back and forth slowly, lazily, as if lulling you to sleep. On the other hand, when you sit in a kubbestol, you are rooted to the ground. The other kubbestols in the exhibit vary greatly in size, but this Norwegian chair demands its presence be felt. It represents power and an immovable, proud sense of self. Comparing a rocking chair to a kubbestol is nearly impossible, which is why this object in the exhibit is so rare. Observing the kubbestol rocker in the exhibit, the details come to life. Scars cover it, traces left by the axe used to carve this rocker out of a giant log. Though this chair is hollowed out in the center, one would not be able to tell upon moving this massive weight, which demands it stay rooted in one spot. Paint on the end of the seat has worn away from use, showing that this was clearly a loved object even though it was made for Little Norway. 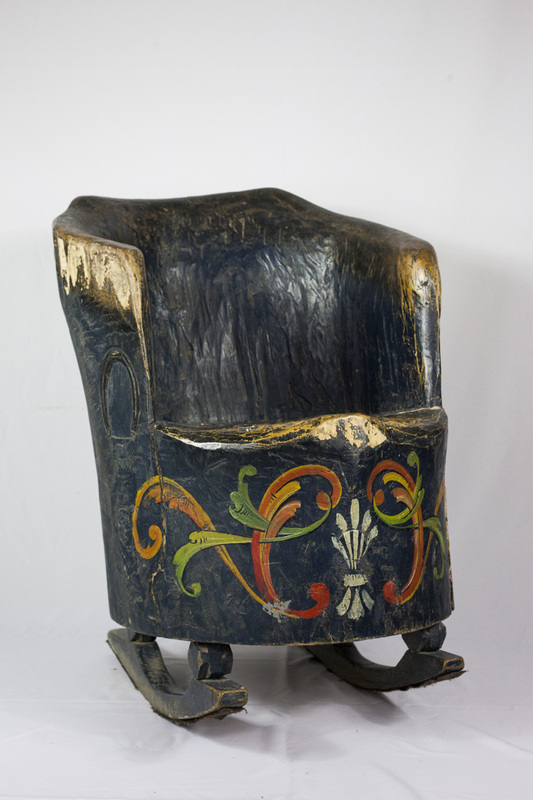 Olaf Colberson, an artist with a tragic past, did the large and swooping rosemaling along the bottom of the chair. Horseshoes carved on either side of the chair can be easily scanned over in one’s haste to study the rest of the object. A large crack traces the left side of the chair, showing the wood expanding with age, stretching out and making its presence known. Then there are the rockers. How did they come to be on this kubbestol? This powerful, heavy mass of a chair seems like it would smash the rockers into the ground. This beast of a chair could not possibly move the way the rockers imply. Who thought this was a good idea? Marrying this uprooted tree to such a fluid, calming idea of a rocking chair seems ridiculous and yet it is perfect for this exhibit. Mount Horeb was a community of immigrants that wanted to pass their culture down to their future generations and they clearly succeeded when you look around the Historical Society. However, this Norwegian culture does not remain untouched. Children of these immigrants not only cared for their Norwegian roots, but they also wanted to grasp the shifting nature of American culture. Both the rocking chair and the kubbestol are symbols of the nostalgia that is a focal point at Little Norway. Combining these two chairs by placing rockers on a kubbestol, this object represents a cultural hybrid of idealized identities, highlighting a theme of reinvention and cultural fusion often practiced by Norwegian-American immigrants.